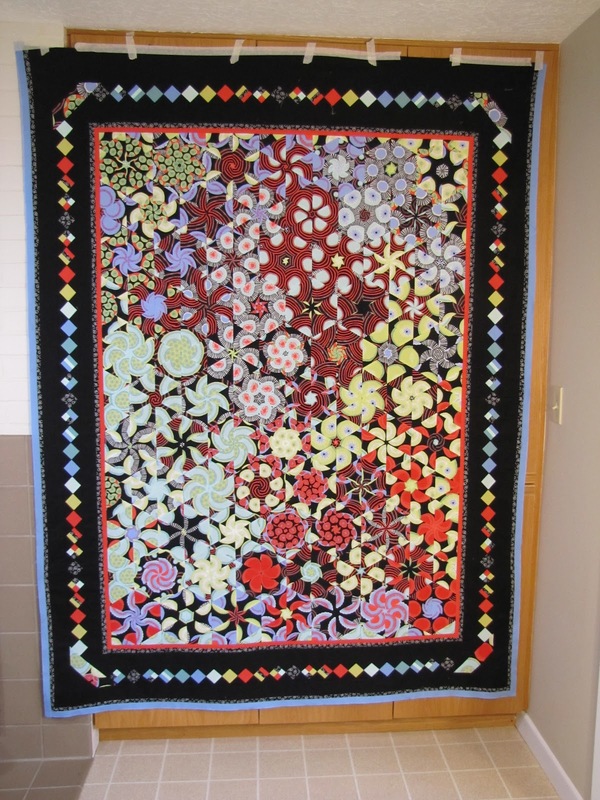 I had been admiring some of the One Block Wonder quilts I had seen at various shows. I bought this fabric at Fibers in Motion (now sadly closed) and started laying out the design for a queen-size quilt. 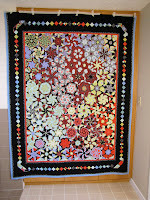 The next step was determining what to do for the quilting. For the center portion I decided on large spirals, in keeping with the natural motion created by the hexagons. After three bad starts and some practice improving my stitch ripping techniques, I just decided to go for it. The next question: "what to do with the large black outer border?" After playing around with some quilting patterns on scraps I decided to do a Greek key type design to reflect the square theme of the seminole border. This required some chalk marking for guidelines. Hmmm. I remember I don't like following lines, but too late now. I am about halfway through the quilting of the outer black border. So where do I go from here? Two months ago and nearly 10 months after the inital work on the quilt, I laid it out on our bed in hopes of rekindling my interest in completing it. My husband, Mark, walked into the room. I loved his comment: "So is this what you made in the last two days?" On the up side, he really liked the colors and the design so that may be just the spark I need to complete it....someday.